Protologue: Benth. & Hook.f., Gen. pl. 1(3): 824 (1867). Acanthosicyos horridus is endemic to the Namib Desert of the south-west coast of Africa and occurs from southern Angola, through Namibia to South Africa (north-western Namaqualand). The distribution of nara is limited to the coastal part of the Namib Desert where it grows exclusively in the sand dunes of mostly dry river beds where subsurface water is available. Before the introduction of maize into southern Africa, nara was a traditional staple food. Archeological evidence indicates that it has been a staple food for at least 8000 years, and was transported and perhaps even traded that long ago. It has not been domesticated and attempts to introduce it elsewhere have not been successful. Young stem tips are browsed by livestock. The bitter roots have medicinal value. Either chewed or made into a decoction, they are used to treat nausea, stomach-ache, venereal diseases, kidney problems, arteriosclerosis and chest pains. The crushed root mixed with fat is used to heal wounds. Oil from the raw or boiled seeds is used as a skin moisturizer and to protect the skin from sunburn. The composition of the seeds per 100 g edible portion is: water 5.3 g, energy 2709 kJ (647 kcal), protein 30.7 g, fat 57.0 g, carbohydrate 2.3 g, crude fibre 1.3 g, Ca 100 mg, Mg 363 mg , Fe 4.0 mg, Zn 5.5 mg, niacin 2.2 mg. The composition of fresh fruits per 100 g edible portion is: water 84 g, energy 231 kJ (55 kcal), protein 1.4 g, fat 0.3 g, carbohydrate 11.7 g, fibre 1.0 g, Ca 21.4 mg, Mg 19.0 mg, P 22.4 mg, Fe 0.5 mg, Zn 0.6 mg, carotene 0.12 mg, thiamin 0.01 mg, riboflavin 0.02 mg, niacin 0.75 mg (Van den Eynden, V., Vernemmen, P. & Van Damme, P., 1992). The ripe fruits are aromatic and the pulp is rich in sugars. The fruit pulp and plant sap contain a non-volatile enzyme which curdles milk. A high percentage of the seed-oil is made up of polyunsaturated fatty acids, with a linoleic acid content of 53%. 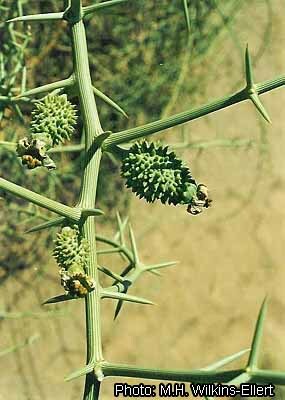 Perennial, dioecious, strongly branched shrub up to 1 m tall and 15(–40) m in diameter, with a very long, woody taproot; stem longitudinally grooved, pale yellowish to pale green, spiny; spines in pairs, 2–3 cm long. Leaves reduced to minute scales, apparently absent. Flowers unisexual, regular, 5-merous, sessile or shortly stalked in spine axils; calyx campanulate, with ovate lobes, greyish hairy; corolla deeply lobed, lobes broadly ovate, c. 1 cm long, fleshy, pale yellow or pale green; male flowers solitary or fasciculate, with 3–5 stamens; female flowers solitary, with 5 elongate staminodes and inferior, ovoid ovary densely covered with oblong-conical, 2–2.5 mm long, soft spines, style columnar, with 3–5 two-horned flat or capitate stigmas. Fruit a subglobose berry up to 20 cm in diameter, covered with spiny protuberances, ripening from green to pale yellow or pale orange-yellow, many-seeded. Seeds embedded in yellow to orange-yellow pulp, oblong or ovoid, 12–16 mm × 7–11 mm × 5–7 mm, cream-coloured, hard with a thick testa. Acanthosicyos comprises 2 species and is placed in the tribe Benincaseae, together with important genera including Benincasa, Citrullus, Coccinea, Lagenaria and Praecitrullus. Acanthosicyos naudinianus (Sond.) C.Jeffrey differs notably from Acanthosicyos horridus in its creeping, annual, leafy stems. Nara is able to survive in a hyper-arid desert climate because of its woody taproot that grows deep into the sand allowing it to reach subterranean water. It can survive in years without any rainfall and in some areas it is the only plant species found. A single nara shrub can cover an area of up to 1500 m2. Nearly 40% of the plant’s aboveground biomass is made up of spines, the rest of stems. In the absence of leaves, photosynthesis takes place in these spines and stems. The dense lattice-like growth of older stems serves to catch and bind windblown sand, acting as a dune stabilizer and thus the plant builds up its own dune micro-ecosystem. Male plants produce more flowers than the female ones and may flower nearly all year long, with a decline in flower production during early winter (May–July). Female plants flower from August–April, and their fruits mature from December–May. Having sticky pollen, nara is probably pollinated by insects. Germination has been reported by local inhabitants to occur only after rain. The age of mature fruiting nara plants may exceed 100 years. The coastal Namib Desert where nara is found receives extremely low and variable amounts of rainfall, the annual average not exceeding 100 mm, and in some years there is no rain at all. Precipitation is augmented by the frequent occurrence of fog. The distribution of nara roughly approximates the inland limits of the fog belt. Temperatures along the coast are fairly constant, the minimum averaging 16°C and the maximum 21°C. Due to the constantly shifting dunes, soil formation does not occur, thus presenting a nutrient-poor plant environment. The mineral composition of the dune sands is quartz, feldspar and garnet. Sands underneath nara plants are exceptionally low in nitrogen and phosphorus content. Other plants sometimes found growing in association with nara are the dune grass Stipagrostis sabulicola (Pilg.) De Winter, and the leaf succulent Trianthema hereroensis Schinz. Nara plays an important ecological role in the Namib Desert, providing shelter, food and water for many species of invertebrates, reptiles, mammals and birds, some of which are endemic and depend entirely on nara for their survival. The 1000-seed weight of nara is about 300 g. Seeds germinate easily, but plants seldom flourish in cultivation. 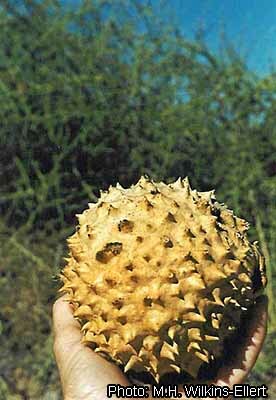 Nara fruits are collected from wild plant populations. They are neither cultivated nor domesticated. Attempts to domesticate the nara bush have been unsuccessful for reasons relating to its very specific habitat requirements. Each family of the Topnaar people of the Lower Kuiseb Valley near Walvis Bay, Namibia owns a number of nara bushes, which are considered private property, but not including the land they grow on. Harvesting is only allowed from the plants owned by the family concerned. At the time nara fruits begin to ripen (from December onwards) many Topnaar families move to the nara fields to harvest and process the fruits. The harvesting can last until May. The Topnaar people process the nara fruits into a preserve. Ripe fruits are collected and either buried in the soil or left in the sun for softening, after which they are peeled and then boiled until the seeds become loose. The pulp is allowed to thicken and turns into a dark orange colour. After separating the seeds, the thick remaining pulp is poured out and allowed to dry in the sun. It solidifies in a few days, forming flat leathery cakes, called ‘goa-garibeb’, which are then cut into strips or rolled up for storage. These fruity rolls have good keeping quality and can be chewed or added to porridge for the remainder of the year. The seeds are sieved from the boiled fruit flesh, dried in the sun and stored for eating, grinding into a flour, or sale to traders. Raw seeds are separated from the fruit pulp by rubbing them in the sand. Wilkins-Ellert, M.H., 2004. Acanthosicyos horridus Welw. ex Hook.f. [Internet] Record from PROTA4U. Grubben, G.J.H. & Denton, O.A. (Editors). PROTA (Plant Resources of Tropical Africa / Ressources végétales de l’Afrique tropicale), Wageningen, Netherlands. <http://www.prota4u.org/search.asp>. This page was last modified on 28 April 2018, at 23:12.